This post will focus on the steps to making colored rice with materials you more than likely already have at home. 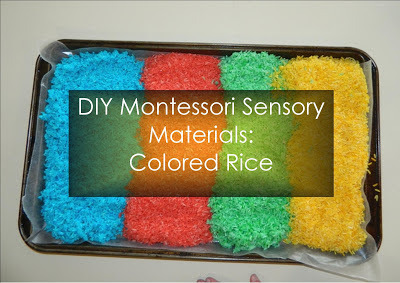 I'll give you some insight on how to present a sensory box with colored rice and some ideas on some Montessori work you can complete with a sensory box. 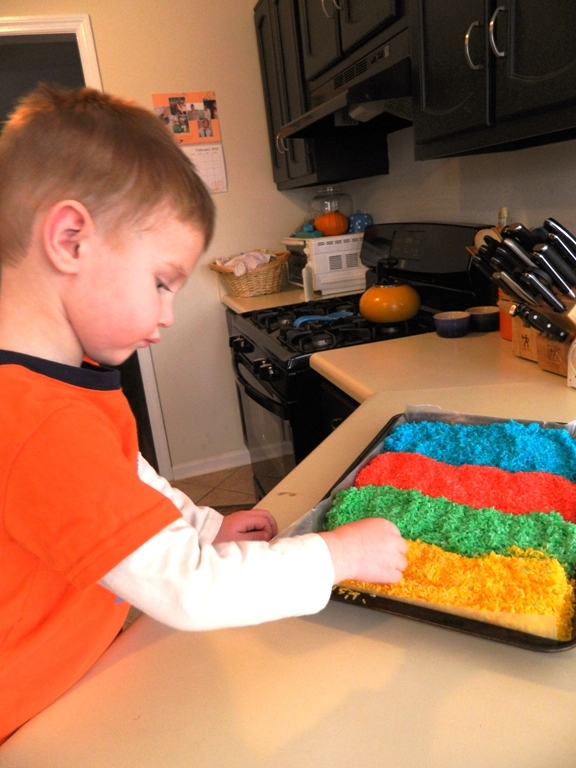 Samuel and I made colored rice last spring before Avalyn was born. We used it in so many projects that our stash began to dwindle. (We have a dog that has an obsession with eating many non-food items including colored rice!) So with our little baggie of left over rice, I thought now would be a great time to put together some new colored rice and share our process. First, we gathered our materials. White rice is pretty cheap. We bought a huge bag from Sam's Club to use for our projects. 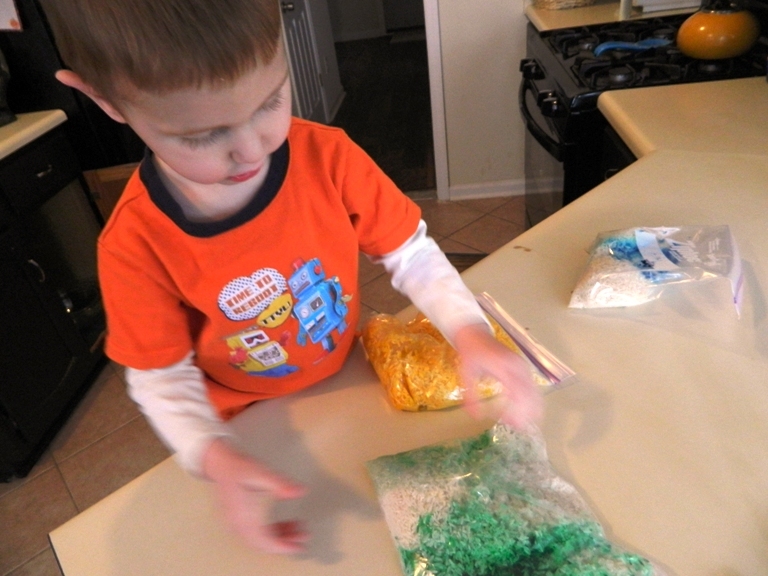 Then we have a couple zip lock bags, food coloring, and (not pictured) white vinegar. I used rubbing alcohol instead of vinegar last time I made this and I didn't see much of a difference in our end product. 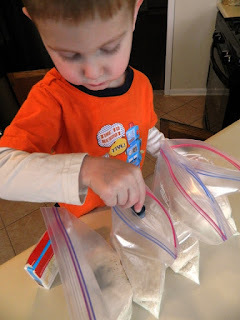 We added about 2 cups of rice to each bag. We chose to use 4 colors so we had four bags. This is great pouring/transfer work! Sam has been working on getting caps on and off. This cap was especially small and he worked for a minute to figure out how to get it off. We added about 7 or 8 drops of food coloring to each bag of rice. If you use less you will get lighter colors. Use more for brighter colors. 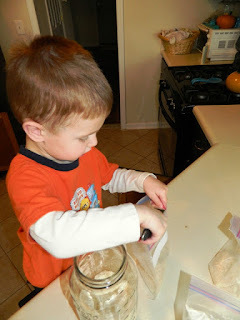 Then I added about a tablespoon of white vinegar to each bag. Close the bags up tight and shake, Shake, SHAKE!! Sam took a minute to line up his bags and said he like the red color the best. 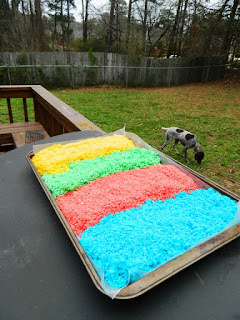 I lined one of our older cookie sheets with wax paper and laid out our colored rice. Some rice spilled off the side and I was very happy to see that Samuel wanted to take the time to replace the pieces that spilled. This concept is something we have been working on during our transfer work this week. Last, we set our cookie sheet outside to let our rice dry. It stayed out there for the afternoon while we visited the park. Doesn't have to be a super warm or sunny day. Just not as windy so your rice doesn't blow away. 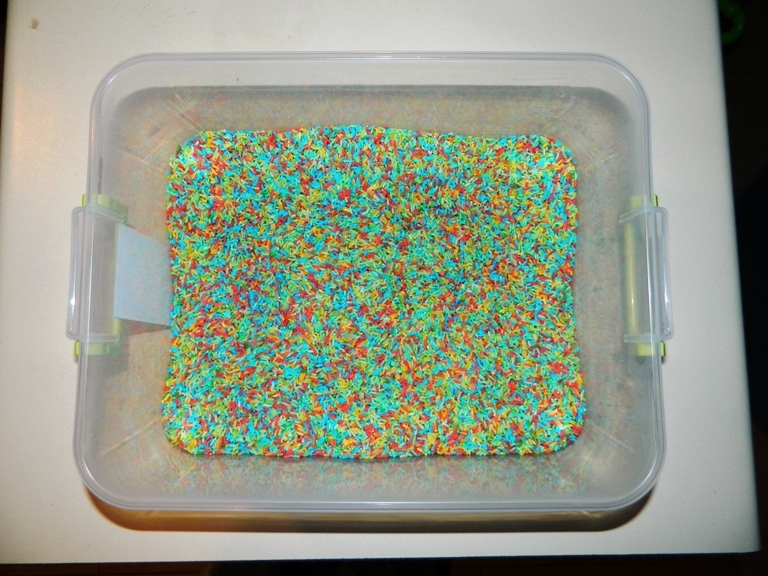 The end product is all the rice in our sensory bin all mixed up ready to be worked with. 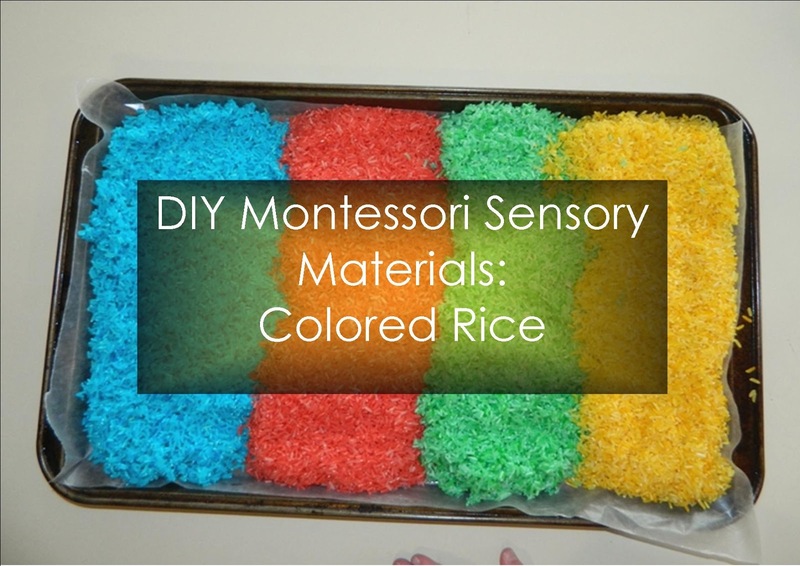 Using colored rice in a sensory box can give your little one so many great experiences. 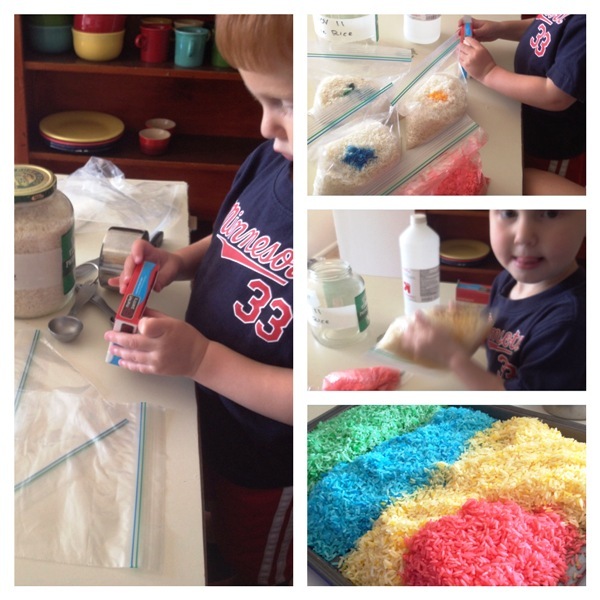 I used John Bowman's book Help Your Preschooler Build a Better Brain for some ideas for my first sensory box. 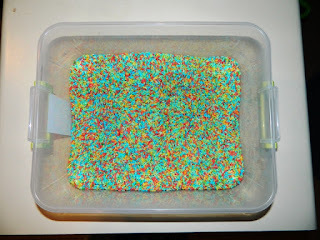 A sensory box can enhance your child's sense of touch by feeling the rice, they can practice pouring and using simple tools in their box like scoops or measuring cups. Using these materials will help strengthen the muscles used for pouring water from a pitcher to a cup and the muscles used for writing. To present this box just set it up and let them explore. No need to guide too much. 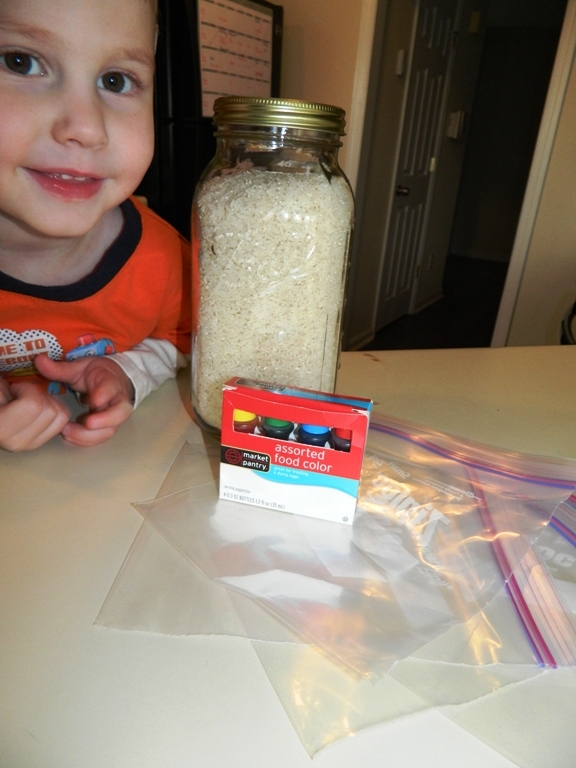 Although I have found that presenting the fact that rice stays in the box is important. The sounds of the rice against the box, as it falls on itself, or poured with materials will be interesting to them. 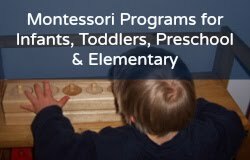 Use glass, plastic, and wooden materials to hear different sounds. Colors will intrigue them. Any discovery of hidden objects will excite them. It is truly and amazing experience to watch them learn and discover. Take a minute to enjoy that moment for yourself as well! Once the rice has lost its intrigue you can change the materials in your box. 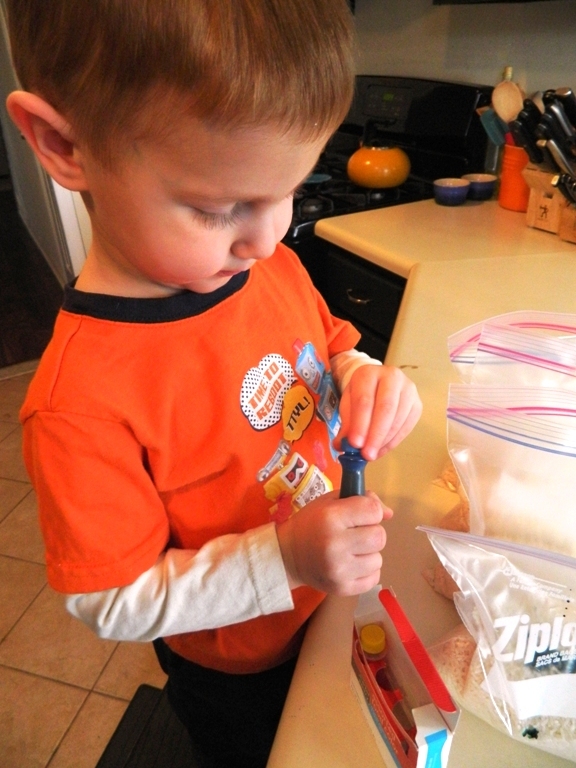 Try beans, wood chips, marbles, water, or shaving cream! Anything you can think of for them to get a new sense will be wonderful. We bought a set of small construction vehicles (Sam still has an obsession with construction vehicles) and practiced having the loader load rice into the dump truck. You can try using a funnel or sifter as well. 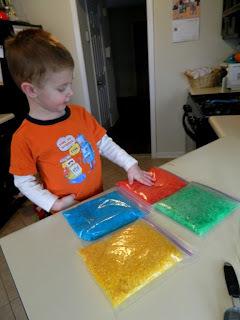 You can use your sensory box for counting. We have a set of Discovery Toys Measure Up Cups. These cups are designed to fit inside one another, but can also be used for measuring. If you fill up the number 1 cup and the number 2 cup they will fit perfectly into the number 3 cup. 1+2=3! We use the rice in our sensory box for counting with our measuring spoons too. How many 1/4 cup measuring cups fit in the 1 cup measuring cup? Or how many tablespoons fit into the 1/2 cup? Sensory boxes can help with language. Bury small animals in your sensory rice box and make name cards with the names of the animals. When your child discovers one of the animals help them find the matching name card. Make animal sounds too. 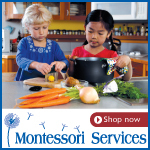 This helps with imagination and creating letter sounds for younger children. Use your sensory box for art. 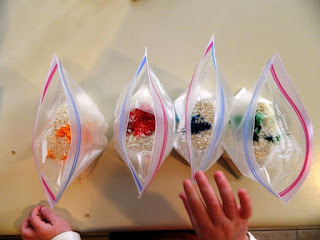 Replace your rice with colored shaving cream or paint. Three piles of three colors. Then mix them all together. What colors did you make? Draw pictures in your new colors. Or add a small ball to decorate. Give it some hair and a beard! I love sensory boxes. 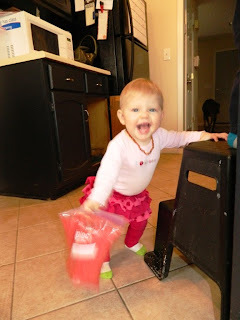 A good sturdy box with a good lid can provide hours of fun and learning for your children at any age. Enjoy!